At DEM we use social media on a daily basis to communicate with over 110,000 Facebook followers and over 900 Twitter followers about new blog posts, university news and courses/universities that they may be interested in as potential students. We use our social media channels on our clients behalf to promote client profile pages, course pages and blog posts, and we have seen significant results from this activity. We have progressed to start running paid promotions for our clients, which link the students directly to the websites of our clients. This has also proven to be very successful, so we thought we would share our social offerings with you. If you are looking to drive your student recruitment for a particular course, we are able to give this course a boost via our social media channels. We encourage the promotional posts to contain a brief summary of the course, a picture, and a clickable link which takes the student to the course details website. The student is also prompted to click through to the website to “find out more information about this course”. If you want to gain exposure for a forthcoming open day event, we can run short term promotions on social media. These posts feature general information about the open day, with a clickable link to the attendance booking form on your website. A picture of the campus or open day location also helps to drive engagement. We can also promote the your whole institution if you are looking for more brand exposure, with a link directly to your website. For these posts we suggest that there is engaging content on the post, such as a welcome video or pictures of your campus, as this results have so far favoured these types of posts. Also provided text that gives an overview of the university and a compelling reasons a student should choose to study with you. Facebook and Twitter both allow for targeted advertising by location, demographics and interests. This enables your institution to gain better quality and relevant traffic. For posts that are sent from the StudyLink.com social media channels, we target both genders aged 18-24 around the world who are interested in education or further study. You do not have to follow this targeting however, and you can send us your requirements. If you already have a profile with us we can also target the specific areas that your profile is setup to target. If you are interested in social posting and you have booked it through your account manager then we ask a few things of you to make the promotion run as smoothly as possible. We need to make sure that the content is great, so we need you to send across as much information as possible about what you want to promote, imagery or video content to support it, and links to where you want the traffic to be directed to. 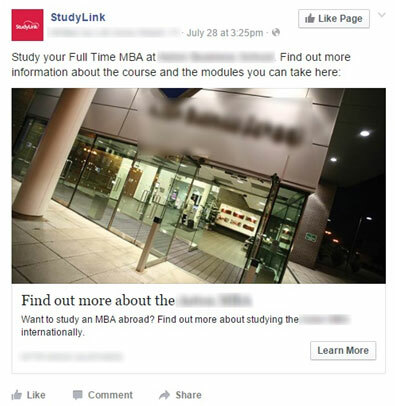 This helps us to create tailored adverts that both you and your prospective students will be happy with! If you have any further questions about using social media throughout your campaign please email your account manager at DEM.